Mount Koya (also called Koyasan) in Wakayama Prefecture is the location of a historic Buddhist monastic community and is a popular center of spiritual retreat. The town of Koya lies on a plateau 800 meters above sea level and is surrounded by the lush green forests of the Kii peninsula. In 2004 it was designated as a UNESCO World Heritage Site as part of the “Sacred Sites and Pilgrimage Routes in the Kii Mountain Range”. There are 117 temples on Mount Koya and many offer overnight accommodation and the opportunity to try vegetarian Buddhist cuisine and participation in meditation and other Buddhist ceremonies. Among the most popular tourist attractions here are many fine historic buildings, beautiful gardens, and Japan’s largest and most atmospheric cemetery. Mount Koya is an essential stop on any tour of Japan and from Kyoto it can be accessed either by train or by car. Mount Koya is the headquarters of the Shingon sect of mystical Buddhism which was introduced to Japan from China by the monk Kukai (774–835). Born on the island of Shikoku, Kukai (also called Kobo Daishi) was a legendary Buddhist saint, poet, teacher, calligrapher, and engineer. He introduced the teachings of Shingon to Japan after two years of spiritual study in China and founded the monastic community at Mount Koya in the year 819. By Kukai’s design the community on the Mount Koya plateau was arranged as a physical mandala; a mystical map of the Shingon Buddhist universe. The eight mountains around the plateau are the mandala’s lotus petals, the Konpon Daito pagoda stands at the mandala’s center, and at the center of the pagoda is a statue of Dainichi Nyorai, the primal Buddha. Kukai died on March 21st in the year 835. However, there is a legend that Kukai did not really die, but is still in a state of deep meditation inside his mountain tomb on Mount Koya, praying for our salvation. Kongobuji Temple (literally “Diamond Peak Temple”) is the head temple of Shingon Buddhism. It was founded in 1593 by Toyotomi Hideyoshi who ruled Japan at that time. Highlights of the temple are the many beautiful screen paintings and the Banryutei garden. The Banryutei is Japan’s largest rock garden and has an arrangement of 140 rocks which symbolize two dragons flying through clouds. Kongobuji Temple is open from 8.30 to 17.00 with last entry at 16.30. Admission costs 500 yen for adults, 200 yen for elementary school students and is free for pre-school children. 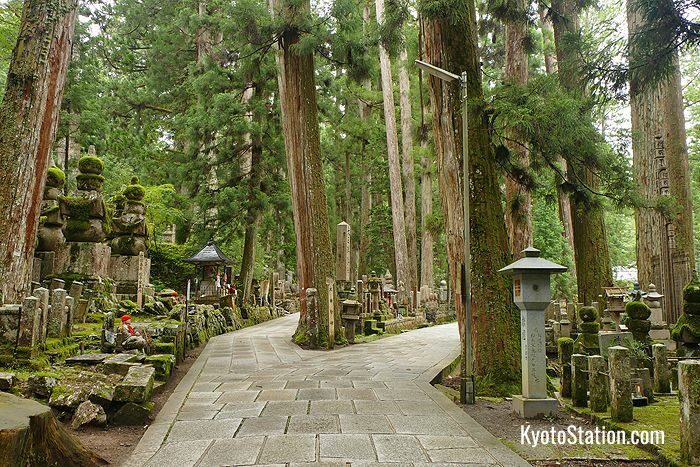 Okunoin Cemetery is one of the most sacred areas of Mount Koya and also the largest graveyard in Japan. Deep inside the cemetery is the mountain mausoleum of Kukai, where it is believed he is still meditating and praying for our salvation. Because Kukai is so respected in Japan, his presence here has made this graveyard extremely popular and a lot of famous historical figures have their tombs here. Among over 500,000 tombs are the graves of several Buddhist saints, historical warlords such as Oda Nobunaga, and several captains of industry. English language night-time tours through the cemetery are available. These tours are both fascinating and highly atmospheric as your guide leads you through avenues of giant cedar trees lit by stone lanterns and points out the more significant graves on the route. Tours cost 2,000 yen or 1,800 yen if you book it in advance online. During the day the cemetery is open from 8.00 till 17.00 from May to October, and from 8.30 till 16.30 from November till April. The Tokugawa family ruled Japan as shoguns, or military leaders, between 1600 and 1868. This mausoleum for the first two Tokugawa shoguns was built in 1643 by the third Tokugawa shogun, lemitsu. There are two identical buildings richly decorated with intricate carvings, lacquerwork, and gold and silver leaf. Together they took 20 years to build. The spirit of Tokugawa Ieyasu the first shogun of the family is enshrined on the right, and Tokugawa Hidetada the second shogun is enshrined on the left. The mausoleum is 200 yen to enter and is open from 8.30 to 17.00 with last entry at 16.30. The Reihokan is a museum built in 1921 to hold and exhibit Mount Koya’s most valuable cultural and artistic treasures. Among the many Buddhist paintings, statues, relics, manuscripts and mandalas there are 21 registered National Treasures and 147 Important Cultural Properties. The Reihokan is open from 8.30 – 17.30 from May to October and 8.30 – 17.00 from November to April. Last entry is 30 minutes before the museum closes. Admission costs 600 yen for adults, 350 yen for university and senior high school students, and 250 yen for junior high and elementary school students. The museum is closed over the New Year Holiday from December 28th to January 4th. Danjo Garan is a complex of temple buildings which was first established by Kukai as the core of his Buddhist community. Together with the Okunoin Cemetery this is one of the two most sacred areas on Mount Koya. The grounds are free to walk around but there are separate admission fees for some of the individual buildings. The grounds are open from 8.30 till 17.00. Below are some of the highlights. The Chumon is the gate at the entrance to the Danjo Garan. It is believed that there has been some form of gate here since 819 however, the gate burned down in 1843 and was not replaced until 2014. The current Chumon gate was rebuilt to celebrate 1,200 years since Kukai was first given permission to establish a monastery on Mount Koya. The Daito Bell is rung five times a day at 4.00, 13.00, 17.00 (or at 18.00 between spring and autumn), 21.00 and 23.00. 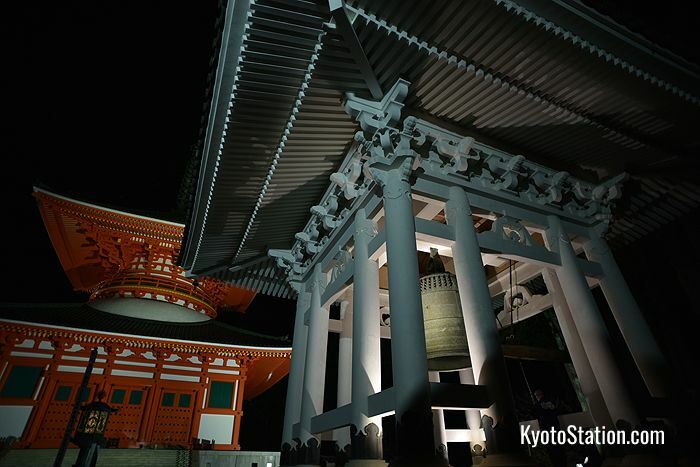 The current bell dates from 1547 and it is the fourth largest bell in Japan with a diameter of 2.12 meters. The Kondo (literally “Golden Hall”) is a Buddhist lecture hall and the main building of the complex. The current building is the 7th to be built here and dates from 1932. Inside are murals by Nihonga painter Kimura Buzan (1876 – 1942), and the main object of worship is a wood carved statue of Yakushi Nyorai (the healing Buddha) by the sculptor Takamura Koun (1852 – 1934). The Kondo is open from 8.30 till 17.00 and is 200 yen to enter. The Fudodo was originally built in 1197, but the current building dates from the 14th century. The four corners of the building are all shaped differently apparently at the whim of four different craftsmen. The Fudodo once enshrined statues of Fudomyo (a Buddhist deity of strong will) and his eight attendants which were carved by the famous sculptor Unkei (circa 1150 – 1223), however as these are very valuable they are now housed in the Reihokan Museum. The Miedo is an elegant building that was once a training hall but now holds portraits of Kukai and his eight disciples. The Miedo is considered so sacred that the public is only allowed to enter it once a year, on March 21st; the anniversary of Kukai’s death. 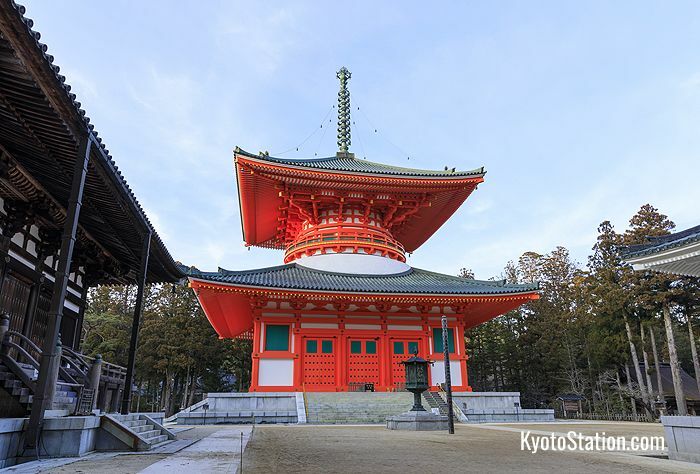 The Konpon Daito is a 49 meter tall two story pagoda and the spiritual center point of the Mount Koya community. Inside is a statue of the primal Buddha surrounded by a physical mandala of four statues, 16 pillars with paintings of Buddhist saints, and images of the 8 great Shingon teachers in the four corners of the room. It is open from 8.30 to 17.00 and entry is 200 yen. English and French language guided tours of Mount Koya are available from the Koyasan Interpreter Guide Club. Weekday tours take 1.5 hours and cost 1,500 yen per person. Customized group tours and trekking tours are also available. Check the Koyasan Cross-cultural Communication Network website for full details on English tours and the Visites Guidées page for information on tours in French. Mount Koya is an ancient site of spiritual pilgrimage. Though most tourists will choose to visit the mountain by the comfortable route of train and cable car, the old pilgrimage routes are still in good condition and confident hikers will find them enjoyable. If you choose to follow any of these courses, be sure to wear clothes and shoes that are suitable for hiking, and bring some rain gear. There are two main traditional pilgrimage routes to follow: the Choishi Stupa Route and the Women Pilgrims’ Route. The Choishi Stupa Route is about 23.5 km long and takes about 7 hours to complete. It is named after the 180 stone stupa (or choishi) which are spiritual signposts marking the way. 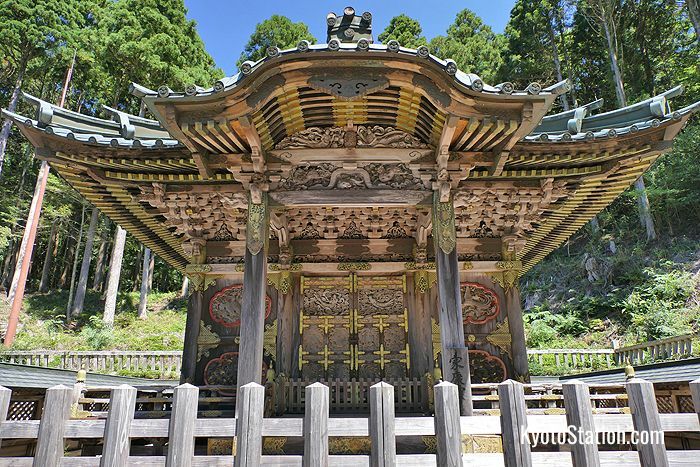 The route begins at Jison-in Temple near Kudoyama Station, takes you through the massive vermilion Daimon Gate which is the traditional entry point to Mount Koya, and finishes at the Danjo Garan complex. You can download a pdf map and guide to the Choishi Stupa Route from the Koyasan Shukubo Association website. Women were not allowed entry to Mount Koya until 1872, so they had a separate pilgrimage route that took them around all seven entrances to Mount Koya but never inside. You can still follow this pilgrimage route today in three stages. The first part is the Fudozaka Course which is a 2.5 km long course between Gokurabashi at the foot of the mountain and Nyonindo Temple. This is the last remaining women’s temple on the outskirts of the Mount Koya settlement. The Fudozaka Course should take about 50 minutes to complete. From here you can follow the Women Pilgrimage Course as far as the entrance to Okunoin Cemetary. This part of the route is 6.9 km long and should take about 2 hours and 20 minutes. The final stage is the Koya Sanzan Course which takes you back to Nyonindo Temple to complete the circle. This part of the route is 8.6 km long and should take about 2 hours and 50 minutes. You can download a pdf map and guide to the Sanzan & Women Pilgrims Routes from the Koyasan Shukubo Association website. 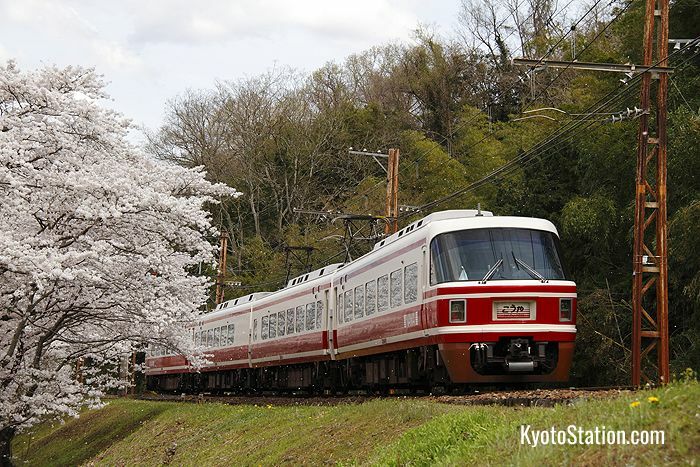 Mount Koya can be accessed from Kyoto by train or by car. If you are traveling by train the simplest route is via Nankai Namba Station in Osaka. Once you get to Nankai Namba Station it is a simple matter of taking the Nankai Koya Line as far as Gokurakubashi Station and then taking a cable car up the mountain to Koyasan Station. You can go to Osaka Station directly by a regular train service and then transfer to the subway to get to Namba. You can go to Shin-Osaka Station by shinkansen and then transfer to the subway to get to Namba. A third option is to travel directly between Kyoto and Namba by bus. When planning rail journeys between Kyoto and Mount Koya we recommend using English language route planners like the Japan Transit Planner or Hyperdia. A Special Rapid service on the JR Kyoto Line will take you directly from Kyoto Station to Osaka Station in 28 minutes for 560 yen. This is the simplest and cheapest route between Kyoto Station and Osaka. However, Special Rapid services between Kyoto and Osaka can be very crowded so you might not be able to get a seat. Also these trains do not have any dedicated luggage space. Once you get to Osaka Station you will then need to transfer to the subway to get to Namba. If you transfer to the Midosuji Subway Line at Umeda Subway Station you can travel to Namba Station in 9 minutes for 230 yen. The subway station at Namba is an 8 minute walk from Nankai Namba Station. Traveling by shinkansen from Kyoto Station to Shin-Osaka Station takes 12 minutes and costs 3,020 yen for a reserved seat or just 1,420 yen for an unreserved seat. As well as speed the other advantages of taking the shinkansen is that there is more space for your luggage and if you pay extra for a reservation you will be guaranteed a seat for the first part of your journey. Please note that among the different shinkansen services that depart from Kyoto Station the Japan Rail Pass does not cover the Nozomi service. From Shin-Osaka Station you can transfer to the Midosuji Subway Line which will take you to Namba Station in 15 minutes for 280 yen. The advantage of taking a bus from Kyoto to Namba is that there are no transfers on the way. If you have a lot of luggage this might be an easier option for you. Keihan Bus run a direct bus service between the Hachijoguchi Exit of Kyoto Station and Namba OCAT. It takes 1 hour and 17 minutes and costs 800 yen. The Keihan Bus ticket office is on the first floor of the Avanti Building which is directly opposite the south side of Kyoto Station. You can download a PDF timetable from the Keihan Bus website. From the Namba OCAT bus terminal it is a 12 minute walk to Nankai Namba Station. Limited Express services run directly from Nankai Namba Station on the Nankai Koya Line to Gokurabashi Station in 80 minutes for a full fare of 1,650 yen. If you take an Express or Rapid Express service, it will cost just 870 yen but you will normally have to transfer to a local train at Hashimoto Station. At Gokurakubashi Station you will then board the cable car which will take you up the mountain to Koyasan Station. The cable car takes 5 minutes and costs 390 yen. Please note that the Japan Rail Pass does not cover the Nankai Koya Line. Traveling by car from Kyoto to Mount Koya will take around 2 hours and cost around 3,500 yen in toll fees. Of course you should also factor into your expenses the cost of renting a car. The simplest route is to take the Meishin Expressway, the Kinki Expressway, the Hanwa Expressway and then the Keinawa Expressway. However, once you have rented your car you can put your destination’s address into the car’s GPS satellite navigation system and it will show you the way. If you are traveling between November and April you will need snow tires on your car as the weather on Mount Koya gets much colder than in Kyoto. There are a number of car rental businesses around Kyoto Station. For more information on these please see our article Car Rental in Kyoto. To get from Koyasan Station to your temple lodging or to any of the main tourist sites you will need to take a bus or a taxi. From the station to the center of town takes about 10 minutes. Buses are boarded from the rear and exited from the front. Take a fare zone ticket when you board the bus and drop it into the fare slot with your exact fare when you get off. You can download a detailed guide to using buses on Mount Koya from the Nankai Rinkan Bus website. The same site also has a downloadable Bus Route Map and Fare Tables. The Koyasan Shukubo Association have a free downloadable map of the general Koyasan Area which shows the locations of all the temple lodgings and also a walking map of the main sightseeing area. Bicycles are available to rent from the Koyasan Shukubo Association’s Central (Chuo) Information Office. They can be rented for 400 yen for one hour and after the first hour they cost an extra 100 yen for every additional 30 minutes. Bicycle numbers are limited, so if you wish to reserve one in advance, call 0736-56-2616. Portable audio guides in 5 languages (English, French, Chinese, Korean, and Japanese) are also available to rent from the Koyasan Shukubo Association. The audio guides cost 500 yen each and can be used between 8.30 and 16.30. They can be rented from the Shukubo Association’s Central (Chuo) or Ichi-no-Hashi Information Offices. You can download a map showing where to borrow and return the guides. A Common Ticket for six different tourist sites is available at any Koyasan Shukubo Association information center. 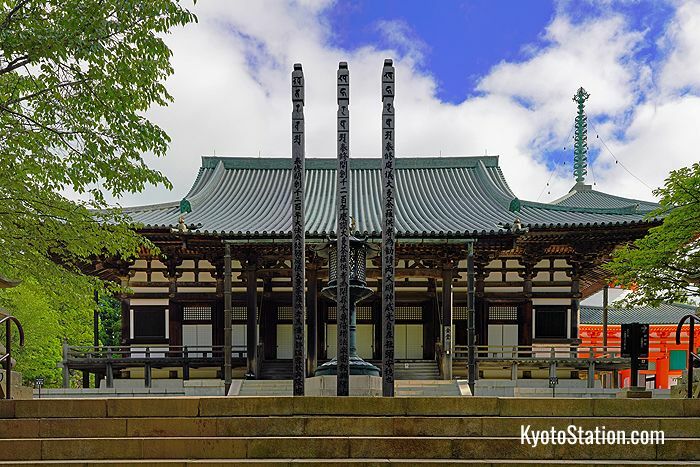 The ticket covers the cost of entry to the Kongobuji Temple, the Reihokan Treasure Museum, the Konpon Daito, the Kondo, the Tokugawa Mausoleum, and also the cost of attending a Japanese sermon on Buddhist teachings at the Daishi Kyokai. Visiting these six sites individually would cost a total of 2,200 yen but the Common Ticket costs just 1,500 yen. Nankai Rinkai Bus company offer a One Day Bus Pass which includes one day’s unlimited bus rides, coupons for restaurants and shops around Mount Koya, as well as 20% off the entry fee for the Reihokan, the Kondo Hall, the Konpon Daito, and Kongobuji Temple. The pass costs 830 yen for adults and 420 yen for children. The Koyasan-World Heritage Ticket is a two day discount ticket that includes round-trip fares on both the train and cable car between Nankai Namba Station and Koyasan Station as well as all bus travel on Mount Koya. It also includes discount coupons for three souvenir shops on Mount Koya as well as a 20% discount on entry to the following tourist attractions: the Reihokan, the Kondo Hall, the Konpon Daito and Kongobuji Temple. There are two versions of the ticket. A regular ticket costs 2,860 yen and can be used for all trains on the Nankai Koya Line except limited express trains. The limited express version of this ticket costs 3,400 yen and includes a limited express ticket for the journey between Nankai Namba Station and Gokurakubashi Station. However, it does not include a limited express ticket for the return journey. This ticket can be bought at major Nankai railway stations and at major travel agencies such as JTB, KNT Kinki Nippon Tourist, and Nippon Travel Agency. The Kansai Thru Pass is worth buying if you plan to travel to other parts of the Kansai region. It covers the cost of the Nankai Koya Line, the Koyasan Cable Line, and Nankai Rinkan buses on Mount Koya. It can also be used for other private rail, bus, and subway journeys in the Kansai region. The Kansai Thru Pass also entitles you to special discounts and promotions at selected tourist facilities and shops in the Kansai area. However, please note that this pass cannot be used on JR railways. The best way to experience life on Mount Koya is to stay in a traditional shukubo style temple lodging. Altogether there are 117 temples on Mount Koya, and 52 of these temples provide traditional shukubo lodging. Typically temple guest rooms feature tatami matting on the floors and are simply decorated with shoji screens, and sliding doors. Guests sleep in futons on the floor and usually there are shared bathing facilities. Many of these temples have beautiful gardens and serve traditional shojin ryori vegetarian meals. This Buddhist vegetarian cooking makes ingenious use of mountain vegetables, mushrooms, tofu, and other seasonal specialties to create delicious, healthy and satisfying meals. Some temples also invite guests to attend their morning prayer service or to join them in Ajikan meditation sessions in which participants meditate on the first letter of the Sanskrit alphabet. The six temples listed below are especially recommended for their friendly service and hospitality. However, as these temples are very popular, we advise booking early to avoid disappointment. Fudoin is one of the most popular temple lodgings on Mount Koya. This friendly temple which was founded in 906 has 22 air conditioned guest rooms. Guests can enjoy delicious vegetarian meals with a view of the traditional garden. Guests can also participate in activities such as scripture copying, Ajikan meditation, or attend the morning prayer service. 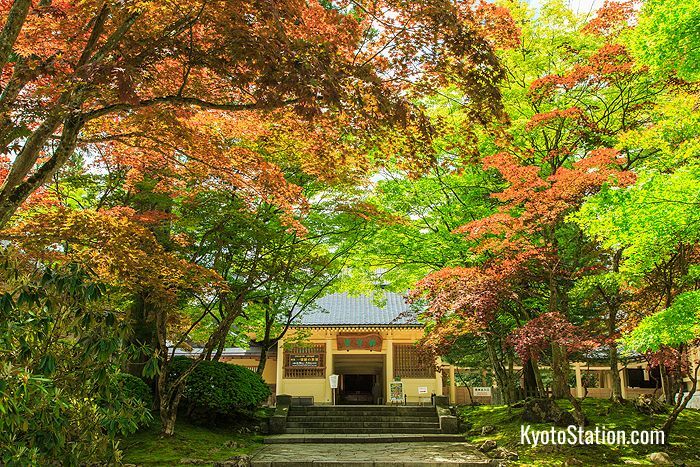 Ekoin is a peaceful temple close by the Okunoin Cemetery which was established almost 1,200 years ago. The temple has 37 guest rooms and features a garden, shared public baths, an internet space and a library. Wonderful vegetarian meals are served in your room. Guests can participate in activities such as copying scriptures, Ajikan meditation, and a dramatic morning fire ritual. Some monks here speak English and can give night tours of the Okunoin Cemetery. Fukuchiin is an 800 year old temple with 66 guest rooms close to the Tokugawa Mausoleum. Because of the large number of guest rooms it can feel a little busier than some of the smaller temple lodgings. However, this temple is a little special as it features natural hot springs with both indoor and outdoor pools and a sauna. The temple’s expansive garden was designed by the famous landscape architect Mirei Shigemori. Like other lodgings on Mount Koya the meals are vegetarian, and guests can participate in scripture copying activities and morning prayers. 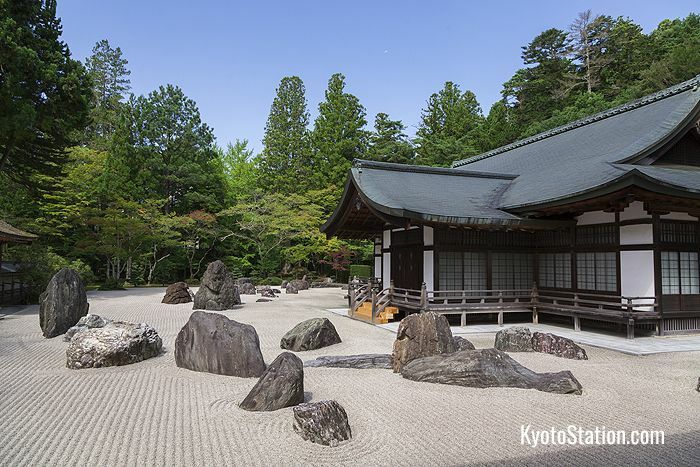 Yochiin is a pleasant temple with an impressive rock garden located close to the Danjo Garan. This temple was founded in 1127 and now has 24 guest rooms. All meals are vegetarian and are served in a common area. Guests can participate in activities such as copying scriptures, copying Buddhist images, and can also attend morning prayers. Jokiin is a very friendly and hospitable temple with 20 guest rooms which is located conveniently close to both the Danjo Garan and Kongobuji Temple. A vegetarian dinner is served in the guest room and a vegetarian breakfast is served in a common area. This temple has a beautiful garden and both indoor and outdoor bathing areas. Guests can attend morning prayers. Saizenin is a beautiful temple close to Kongobuji Temple and the Danjo Garan that has 15 guest rooms. The temple garden was designed by the famous landscape architect Mirei Shigemori. Vegetarian meals can be enjoyed in your room or in the common area. Guests can participate in Ajikan meditation, scripture copying, the morning service and on Fridays there is also a “nenju” prayer bead making activity. Article by Michael Lambe. Photos by I.Sakurai/pixta (1), skylight/pixta (2), Yama/pixta (3,4,7), prof255960/pixta (5), TOM/pixta (6), shiii/pixta (8). All rights reserved.